Annotations – How can we help you today? Learn how to use annotations in Klips. Annotations are notes that you can attach to any Klip to share with anyone who has access to that Klip. They are useful for tracking events that impact the state of KPIs and providing insights into those events. You can even use annotations to link to external websites. Anyone with access to a Klip can make an annotation, but only administrators can edit or delete an annotation. When an annotation has been added to a Klip, you will be notified by a small yellow indicator icon. Note: annotations are not included when copying or importing a Klip and must be manually added to the new Klip. Click Add an Annotation and type your note. Click Save and close the Annotations window. The annotation is added to the Klip and anyone with access to the Klip will see a yellow indicator icon. Note: you must be an administrator to edit annotations. 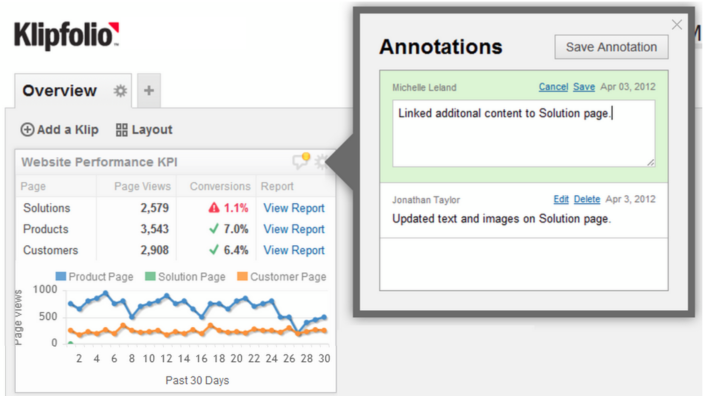 Click Edit and make changes to the annotation. Note: you must be an administrator to delete annotations. Confirm the deletion and close the Annotations window. How do I use bullet charts in my Klips?